Google One is the one stop for all your cloud storage needs. You don’t need to worry about running out of storage space on your mobile phone or desktop with Google One’s cheap cloud storage plans. It can be used across Google apps and services including the Drive, Gmail, Photos, Docs, and more. Google One is now available in India with similar plans available worldwide. Google has now rebranded Google Drive storage plans under the name Google One. Besides rebranding, the company has significantly cut cost on cloud storage for the Google One users. The plans start at INR 130 per month (~$1.99) for 100GB of additional storage. Second plan gives you 200GB of additional storage for INR 210 per month (~$2.99). 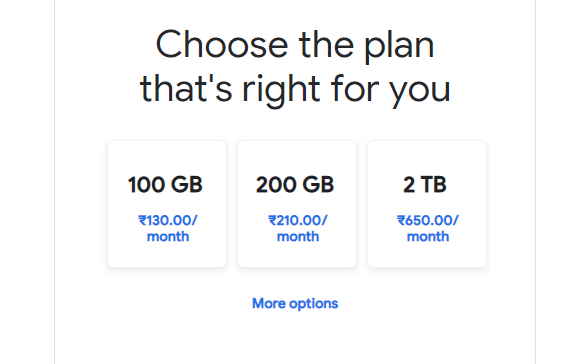 The high end plan goes for INR 650 per month (~$9) for 2 TB of additional storage. You can save significantly by signing up for a year. This will cost you INR 1300 (~$17) for a year of 100 GB storage. Moreover, Google claims that you will also earn Google Play credits and get special rates on hotels found in Google Search. You can even invite up to 5 additional family members to your plan. Family members get extra space for their own storage, plus all the benefits of Google One. You get direct help with Google’s products and services from experts. If you have already signed up for Google Drive storage, you will be automatically subscribed to the Google One storage plan. Google’s deal is quite competitive as compared to Microsoft, Dropbox, iCloud, and more. In order to sign up for Google One, you can simply visit the official website from here.